I come from a long line of stubborn folks. I believe it to be both our secret weapon and our undoing. I suppose it's possible to know when stubbornness will serve you and when it won't, but my reality is that sometimes I choose the wrong things to be stubborn about. I imagine there are also things out there that I could have been more stubborn about, to my advantage. An issue with my stubbornness came to a head this weekend. I might have mentioned before that I have diabetes. For a couple of years, I've been in a place where I'm at the low end of the spectrum. When I first found out I had the disease, I lost some weight and did all the right things. The result was that I moved myself back into the normal and healthy range. Then I don't know what happened. I suppose I got cocky. But I started eating the wrong things again. And before I knew it, all the weight I'd lost was back and my A1C number was back on the rise. The A1C is the critical number in diabetes. It tells your average blood sugar levels over a period of months. People talk about how you can diet and exercise and "cure" diabetes or "reverse" it. There really is no cure for diabetes. When the cells stop metabolizing sugars normally, the damage is done. What you CAN do is eat and exercise in such a way that you don't inundate your body with sugars your cells don't metabolize well. Doing so can bring you back into a healthy range. But you still have diabetes. Sooner or later the disease will progress. I'm sure there are some diabetics that die before diet and exercise alone ceases to work. But it's a progressive disease and eventually, according to my doctor, most people are going to need help. 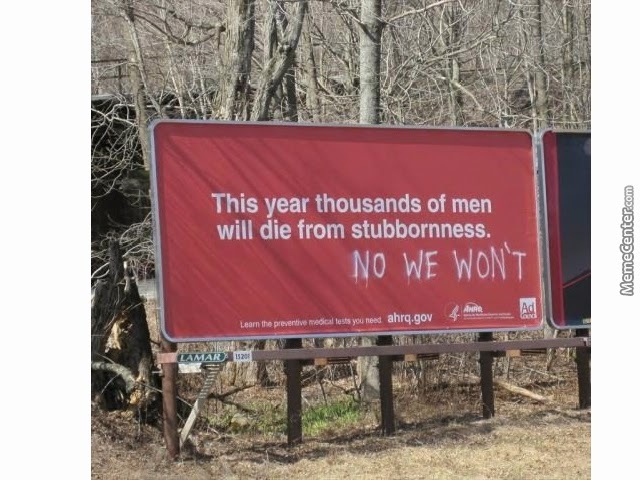 And therein lies the stubbornness. For about a year now, my doctor has been trying to get me to take the medication that helps. And I've been refusing. Because I KNOW I can bring my A1C numbers back into normal range through diet and exercise. The problem is, though, I haven't. I've been flailing around in "trying to get with the program", without actually ever getting with the program. My stubbornness is serving me in that I'm not giving up. But it's working against me in that the damage that diabetes can do to the kidneys isn't being abated. So, long story short, I get my tests back last week and now I need THREE medications—the one I've been refusing to take, the one that can help my kidneys and one that's probably not related. I hate being medicated, because I believe it's a trap. That's why I've been so stubborn. I don't want to start diabetes medication then get stuck on it after I've created the lifestyle changes I need to. But with my kidneys impacted, I need to swallow my pride. For a long time now, I've had the voice of a former Facebook friend of mine in my ears. He's a former Facebook friend because he died from complications from diabetes. He told me, "Tierney, I waited too long to do the right things. Don't wait too long." We need to learn when to give up pushing up against the things we don't want to deal with. We need to learn when to give up the fight...or at least trade it for a new one. His advice haunts me as I struggle internally with weight and food issues that have lasted an entire lifetime, knowing that if I can't break this cycle, it will literally be my undoing. It's easy for thin people to say "just stop eating so much and exercise". That's like telling an anorexic to just stuff down the hamburger. Telling an alcoholic or smoker to just put the drink or cigarette down. Telling a cult member to just walk away. Most people see a lack of willpower. But it goes much deeper than that. And, having dieted and exercised myself thin before and maintained it for many years, I know that diet and exercise alone is not the answer. There's something in the head that needs to click. I know what I need to do, but can't manage to do it. I'm a former smoker and it took me many years of desperate attempts before I finally got it right. But I got it right. My food issues are just that much tougher to address. So anyway, I went to the drug store today to get my prescriptions filled. As I turned to leave the pharmacy, I was overcome with emotion. The pills in my hand represented defeat to me. I believe there was an angel there with me because the lady at the end of the pharmacy line gave me the loveliest and most genuine smile on my way out. She had no way of knowing the emotions swirling in my head. But her smile made me think things would be OK.
As usual, there's a lesson in all of this. The lesson is that I had the doctor call me yesterday to explain my medications to me. It turns out that two of the three medications he put me on are known to help people lose weight. One of them is likely going to put an end to the exhaustion I've been fighting for a couple of years now that adds to my lack of motivation to move. So all my stubbornness was keeping me from the very thing that could help me. But it also might have helped reveal the unrelated issue that I've been wanting answers for for years. So in the end, it seems like things happened just as they were supposed to. As is the way of the universe. And after having the moment of tears over my bruised and humbled ego for not being able to fight this thing alone, I'm beginning to think that the angel at the back of the line is right. Everything's going to be all right. Being on insulin for over 10 years now I felt your story very deeply. My day dreams and stubbornness regarding my life dependent need for my insulin and my constant non stop desire to be normal and get over my need to use this medication to save my life because I just knew that some how I was smarter and could find the right formula and defeat this disease. So I totally get it. I am sure that life can be okay with diabetes and you can live a great life full of many wonderful things. Use your stubbornness to be determined to live the fullest most wonderful life with your diabetes under control. You can do it and you will be ok. Thank you so much for that, Justine. And also to Chloe and jmk, too. The other medication I had to take is for my thyroid—a problem I felt I had for years and kept asking my doctor about. My nutritionist tells me that the range for "normal" on thyroid tests is very large and often doesn't reveal issues. I have literally been exhausted for years, so much so that the gradual descent into total exhaustion and unrestful sleep has just felt like the aging process. Anyway, my thyroid finally inched out of the normal range and I finally got medication after years of complaining to my doctor. Within just week of being on it, I feel like a different person. I'm not 100% yet, but giving in to my pride and just going with this is actually going to support the weight loss I need to get back to "my old self" and also give the inside of my head a total makeover—the fuzziness, lack of motivation and even depression caused by an under active thyroid is now being addressed! So it turned out to be a blessing. The diabetes medication and thyroid are going to support the weight loss I've had issues with for years. So I put the wrong chicken before the egg. While weight loss would help the issues, the issues were standing in the way of weight loss. So medication makes it possible to lose weight, get in shape and get off the diabetes medication (hopefully).